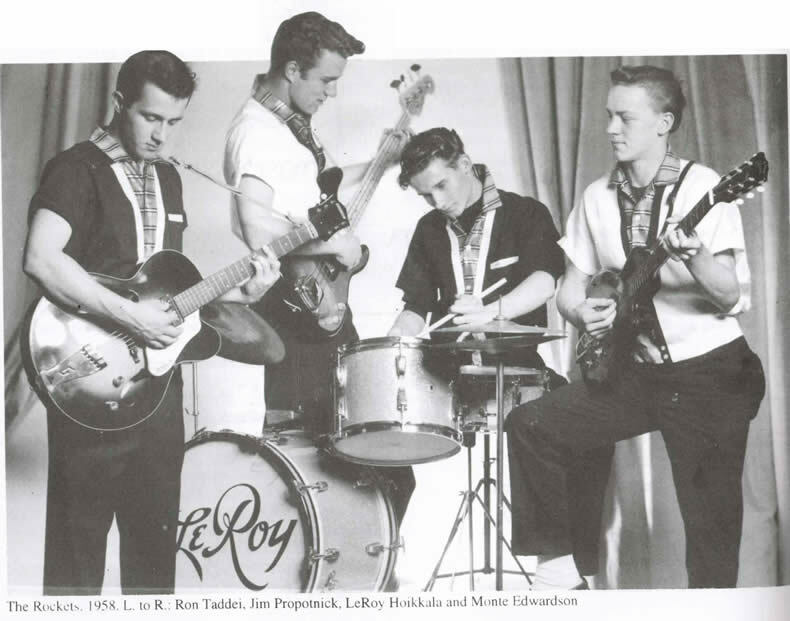 Rock and Roll really started during our era in Junior & Senior high school - 1955-1961. I always tell my grandkids, "If it wasn't for us buying all those records and popularizing all that music, you wouldn't have Rock and Roll!" Below are a few local groups. 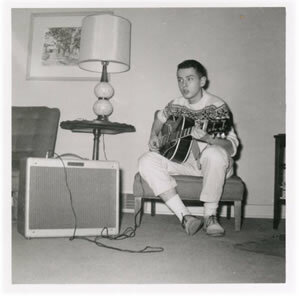 Of course we can't leave out Bobby Zimmerman, alias Bob Dylan Class of 1959. His Mom (Beattie Stone Zimmerman) and my Mom (Marie Johnson) graduated from Hibbing High in 1932 and were friends. We lived kiddie-corner across the street from them so I knew Bobby. His brother, David, my brother, Richard, and I would play together and hang around (See other photos under "Elementary school photos"). We still see David and his wife, Gail, frequently. 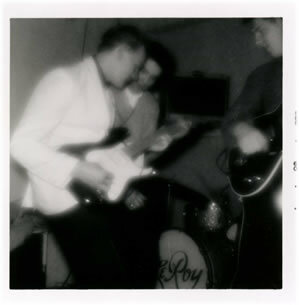 The Golden Chords was comprised of Bob Zimmerman, Monte Edwardson, and Leroy Hoikkala. Finalists in the Hibbing Winter Carnival Talent Contest were selected at a preliminary contest in the Little Theater of Hibbing Memorial Building Thursday afternoon. the four top entries in the two groups will perform prior to the Winter Frolic Queen Coronation at 8 p.m. Thursday in the Little Theater. 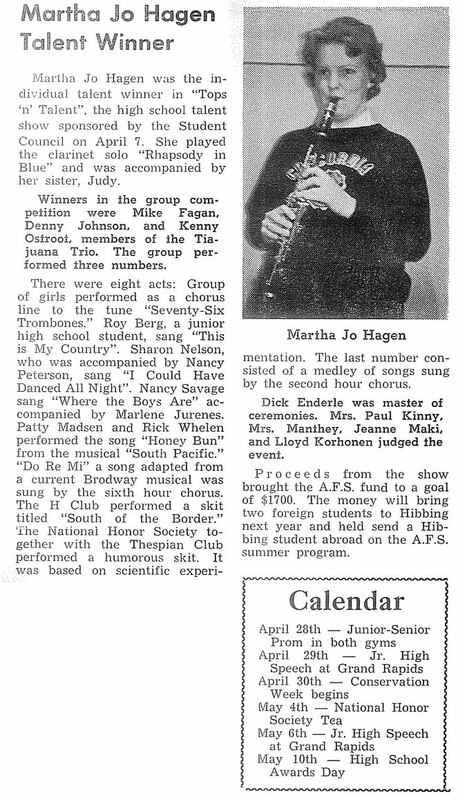 Steven Zimmerman, Shirley Kirsling, Deporah Ylatapia, Judy Koski and Glenda Zubich; Georgine Sampson, dance, Suzanne Plesha, dance, and Linda Christ offerson, singing. 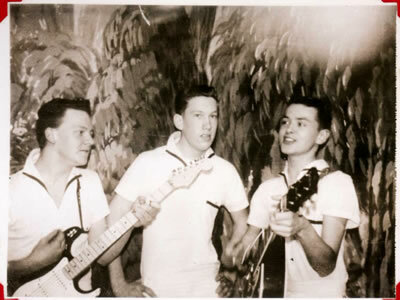 My foray into the local music scene was as a member of the "Tijuana Trio". 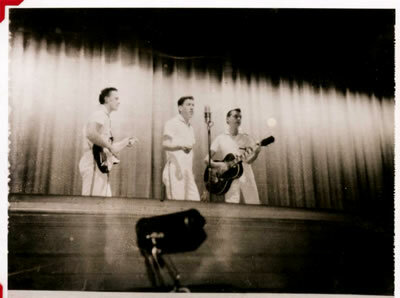 Comprised of myself, (Dennis Johnson), Mike Fagan, and Monte Edwardson (class of 1960), we were doing folk rock songs modeled after The Kingston Trio. 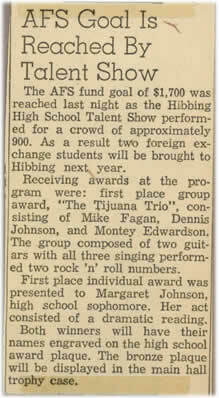 We won the group award at the April 1960 High School Talent Show. 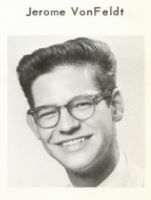 Monte graduated in 1960 and moved away. 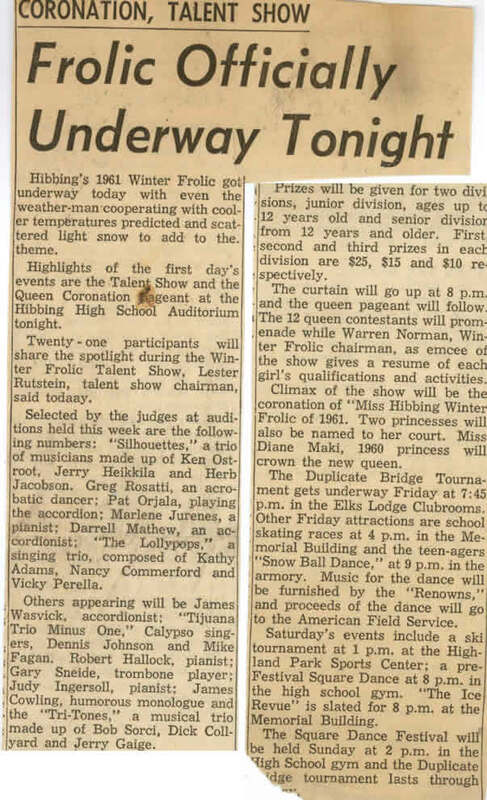 Mike and I enetered the Winter Frolic talent contest in early 1961 as the "Tijuana Trio Minus One" and I can't remember if we won any awards! They referred to us as "Calypso Singers". Mike and I also did several radio "Jingles" or singing advertisements for the Junior Achievment Radio Show which aired on Saturday mornings. These singing ads were played during the week to get listeners of WMFG radio to tune in on Saturdays. We actually got paid for doing that! 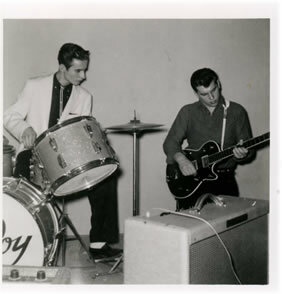 We also played at the 1961 Senior Class Banquet - it says so on the program but I don't remember that gig. 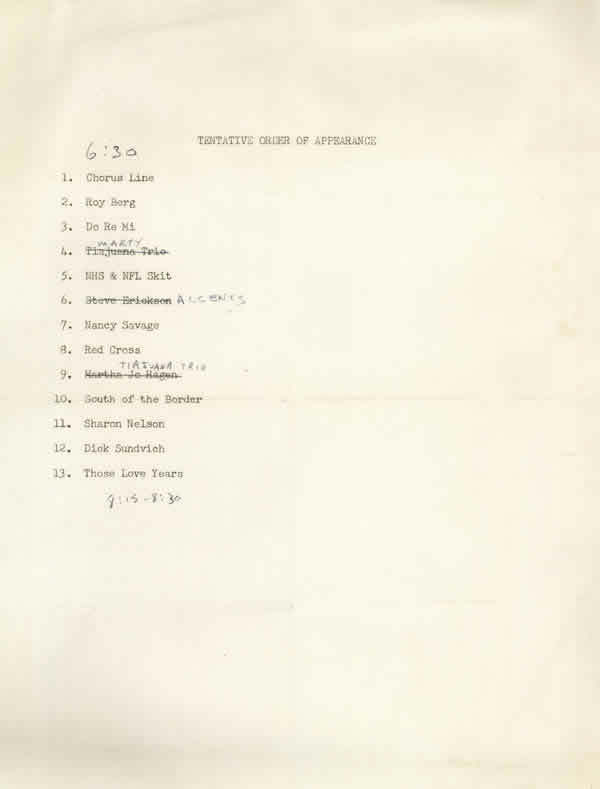 We probably played there because both Mike & I were on the entertainment committee. 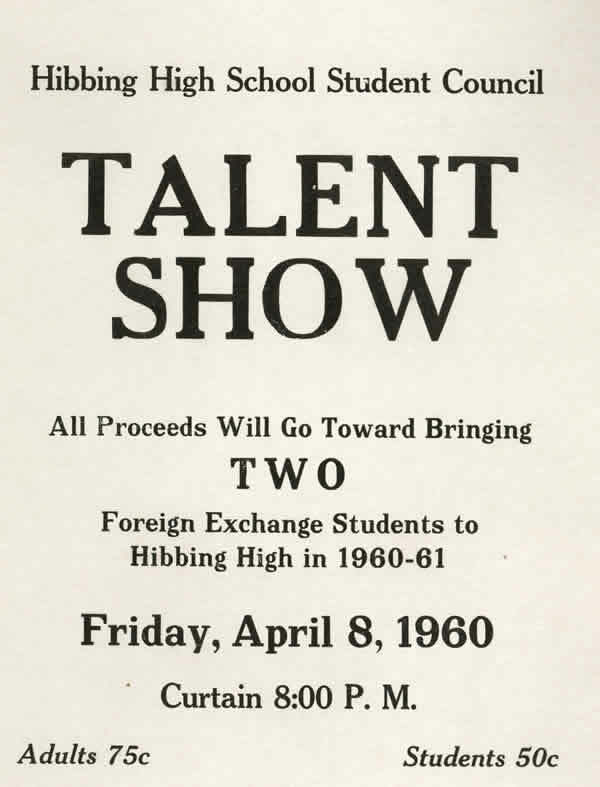 In the Spring 1961 High School Talent Show, we added Kenny Ostroot playing bongos. Kenny was in a group called the "Silhouttes" in the Winter Frolic Talent Show. I guess we changed our name back to the "Tiajuana Trio" because that's how we're listed. We won the group competition. And that's the rest of the story because, going our seperate ways, we never did anything more. Below are some of my personal photos, cards, clippings, and posters. Monte Edwardson, Dennis Johnson & Mike Fagan - "The Tijuana Trio"
2006 note: the above is the actual listing of the order of appearance. 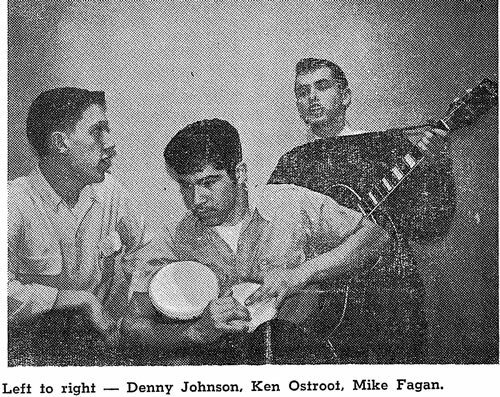 The "Tijuana Trio Minus One" consisted of Dennis Johnson, Mike Fagan (with guitar) and Kenny Ostroot sitting on the stage floor playing bongos. The "Tijuana Trio Minus One" was the group winner. The individual winner was Martha Jo Hagen. 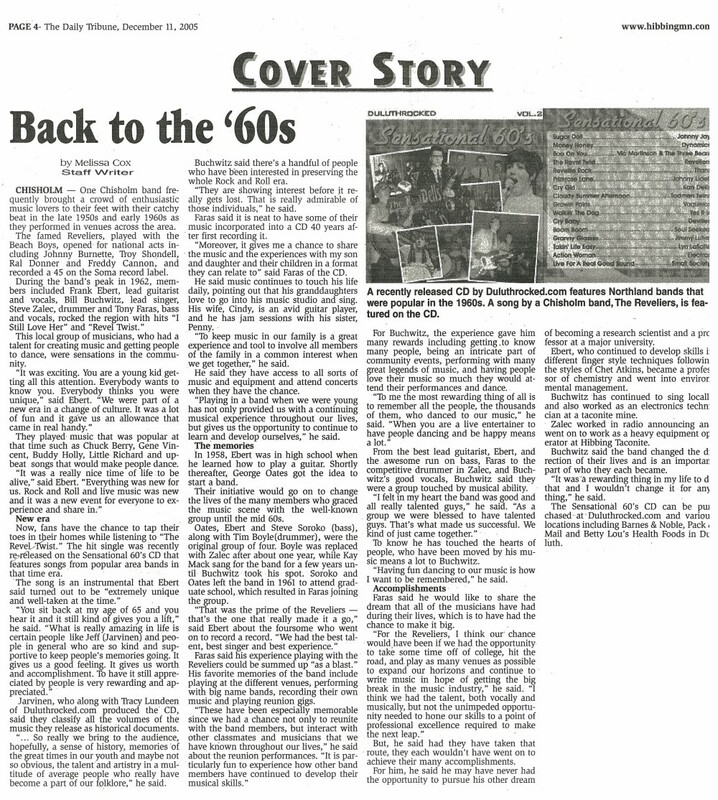 Copyright 1997 Berg Brothers Publishing - "Lost and Found"
CHISHOLM — To the delight of many of their followers, an Iron Range music favorite, “The Renowns,” took to the stage last month, marking the end of a four-year sabbatical. 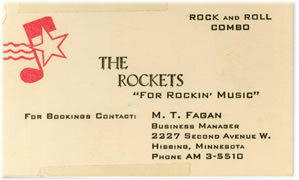 The group was formed in 1955, and played at various locations across the Iron Range. 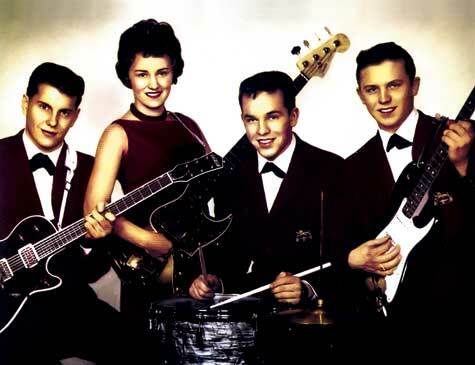 Original members were: Ione Tomasetti on lead vocals and bass; Tony Tomasetti, lead guitar; Warren Grillo on percussion; and David Karakash on vocal and rhythm guitar. Current members of the band are: Ione Tomasetti, Grillo, Tom Moeller on lead guitar and two of the Tomasettis children, Mike Tomasetti on percussion and vocals and Jim Tomasetti on keyboard and vocals. Ione said it was a dinner and dance promoting the local Eagles Club that gave the group a reason to get together once again. The dance, held last month at the Hibbing VFW, brought out many of the band's followers, she said. “A ton of people had a request for those oldies,” said Ione. Playing in front of a live audience continues to be fulfilling for the band. “It’s a lot of fun, and it was really nice getting back in the saddle again,” she added. 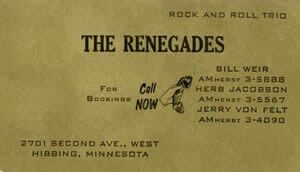 It was in 1959, Ione recalled, that The Renowns permeated the music scene outside the Iron Range. 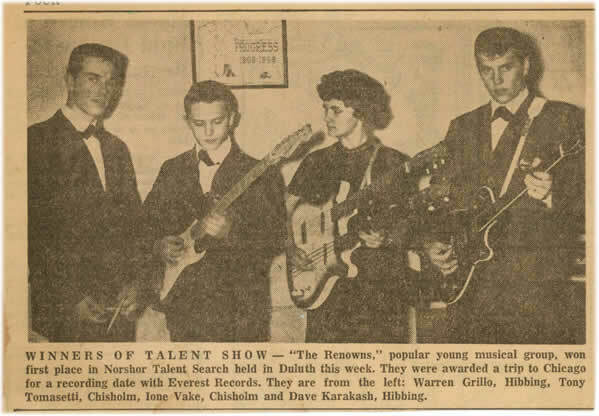 That's when the group won a talent contest sponsored by a Duluth radio station, and was given the opportunity to cut a record with Everest Records in Chicago. One side of the recording contained a song written by Ione, entitled, “My Mind’s Made Up.” The other, a song by Karakash entitled, “The Wild One." The songs topped the charts, and were No. 1 and No. 2 on the east and west coast, respectively, she said. Having both sides of a recording do equally as well was a rarity in the music industry, Ione said. Typically one side of an album would be “hot.” Having a female vocalist on one side of the recording, and a male on the other was also unique, she said. 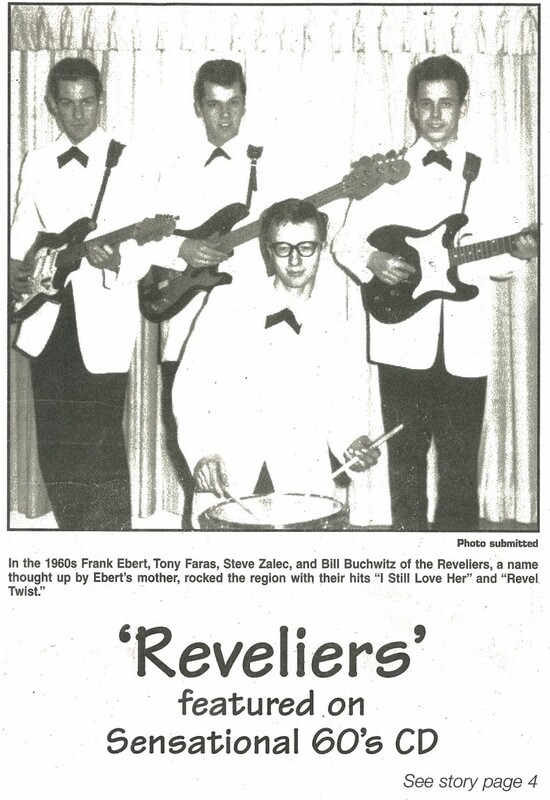 In 1996, the band was shocked and saddened with the passing of Tony Tomasetti. They were faced with the difficult choice of whether or not the band should continue. For Ione, the choice was particularly difficult, being the couple had been together since they were 14 years old. After a five month break, Moeller, a good friend of the Tomasettis joined the band. 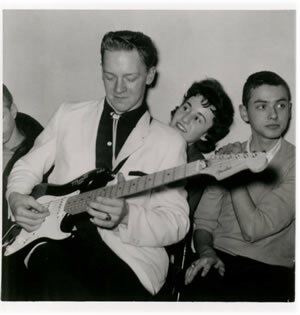 Moeller had jammed with Ione and Tony on several occasions, and proved to be a good fit. Yet those first few practices were very difficult for Ione. 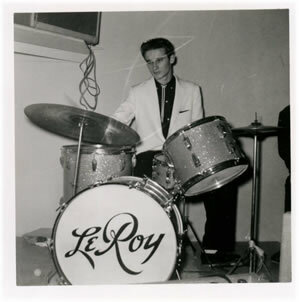 “When he started playing, ‘My Mind’s Made Up,’ it brought up feelings,” recalled Ione. “If we hadn’t done it then and got through that song, we probably wouldn’t have done it again,” she added. 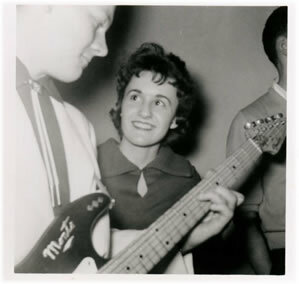 She said the band has been a part of her life forever, and she would have missed it. 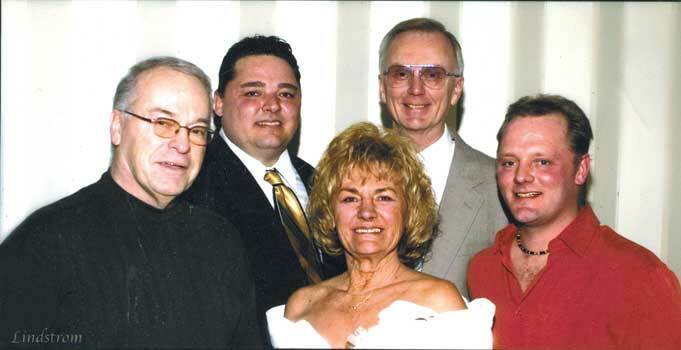 Having Mike and Jim join the band, has made it a “family thing,” keeping everyone close, she said. The Tomasettis eldest son, Mark, is also a talented vocalist, and may some day join the group. 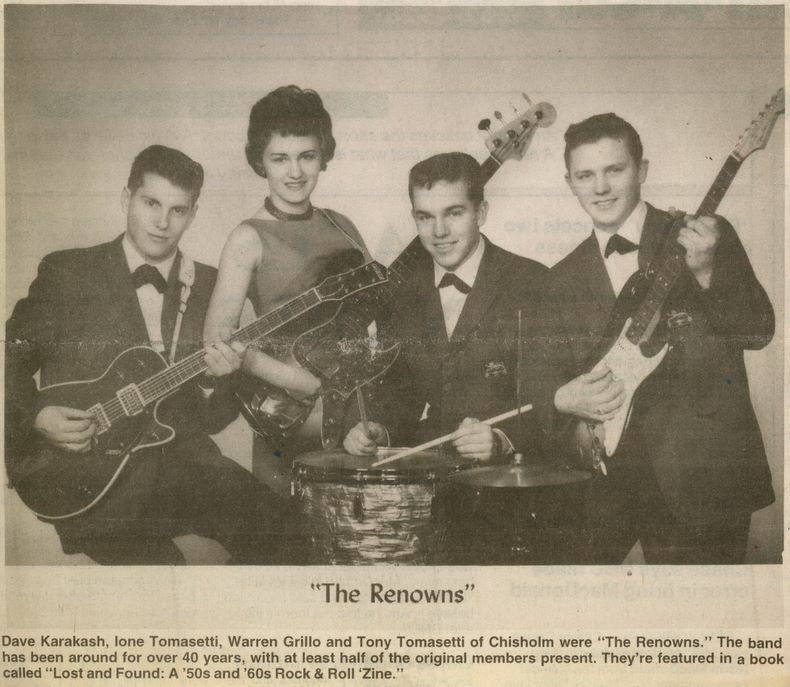 In 2005, The Renowns were inducted into the Rock Country Hall of Fame. Shortly thereafter, the group decided to take the break, which would last four years — the longest in the group’s history. Throughout the break, Ione said her family and Grillo kept singing, along with the Renowns Karoaoke. “But that's a whole different program than live music,” said Ione. 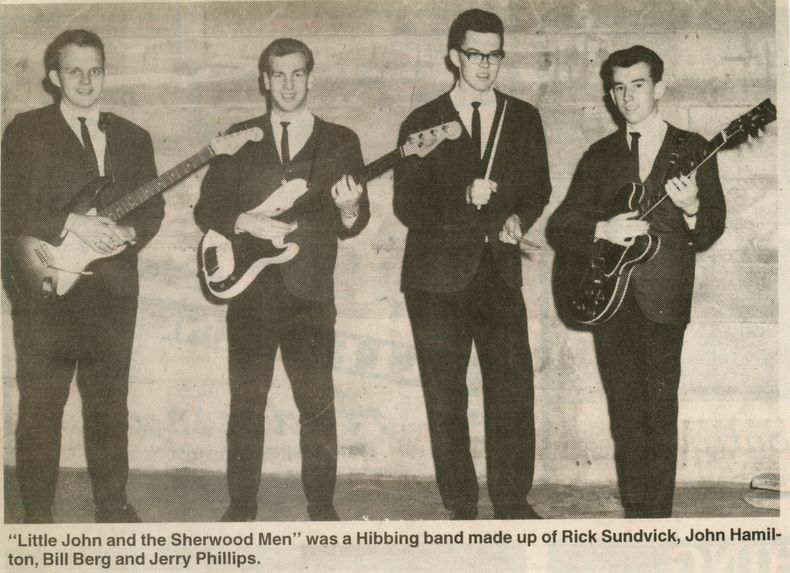 The Renowns' next performance is slated for Saturday, Feb. 26, at the VFW in Hibbing. The event is to promote the Eagles Club, with dinner at 6:30 p.m. and music at 7:30 p.m.
For dinner reservations, call the VFW at 262-6416. Those who would like to attend the dance but not the dinner may do so, but are asked to give a free-will donation.